Taking young kids to the beach can seem like a huge undertaking. 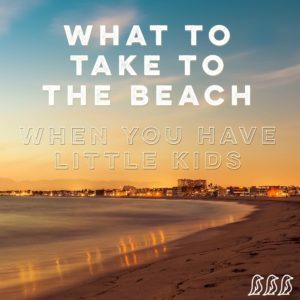 Long gone are the days when you could waltz down to the water’s edge with just a towel… But there are a few things to pack for the beach to make your life a little easier when spending the day in the sand, sun, & water with little kids. Baby powder – I know this tip has been floating around the internet for a while now, but it is worth mentioning again b/c it works! Baby powder takes sand off like magic! Time for lunch? Rub some baby powder on your hands. Sandy diaper change? Baby powder to the rescue. Time to head back home & don’t want to take the whole beach with you? Baby powder all over the kiddos (& yourself). Coconut oil – Here is another internet trend… coconut oil used for everything. BUT I have recently discovered the helpfulness of coconut oil baths. It helps soothe diaper rashes, dry skin, and sun burns. Mix a little coconut oil into the warm bath water for a soothing soak for yourself or your kids. Half frozen water bottles – No one wants to drink warm water while you are roasting hot on the beach. Fill your reusable water bottles up half way and pop them in the freezer the day before. Then before heading to the beach, fill the bottles the rest of the way, and the ice will gradually melt throughout your day in the sun giving you cold drinks that don’t cost $5.00 from the ice cream cart. Non-sand toys – Buckets and shovels definitely belong at the beach, but toys that aren’t specifically meant for the sand also gain new life when brought down to the beach. Toy monster trucks have given my boys hours of entertainment by building cool tracks and ramps and racing them around. Heavy duty shovel – Some kids love the waves. My boys are not those kids, but they do need a way to cool off when we are at the beach. We will usually dig them their own little pool near the water (b/c if you go too far back from the water’s edge, you will need to dig too deep to reach water). These little kiddie pools usually draw in a whole group of kids, which turn into beach play mates for the day – bonus! Wagon – We have a Step 2 wagon that goes everywhere with us. I have gotten so much use out of the thing, and I will gladly buy another the day that it breaks. We walk a few blocks to get to the beach, which means that we pull the boys along, and it will even go through the sand without too much weight in it. Versatile Umbrella – It is helpful to have an umbrella that can offer great coverage whether your child is playing in the sand or laying down for a nap. You also want an umbrella that can offer some protection from the wind & blowing sand & can move around easily as the sun’s position changes. Beach umbrellas like this one from Amazon (affiliate link) can be a great option!